The ponytail palm (Beaucarnea recurvata) makes a surprisingly interesting desktop plant, considering that in nature, it's a full-size tree that can tower over homes. 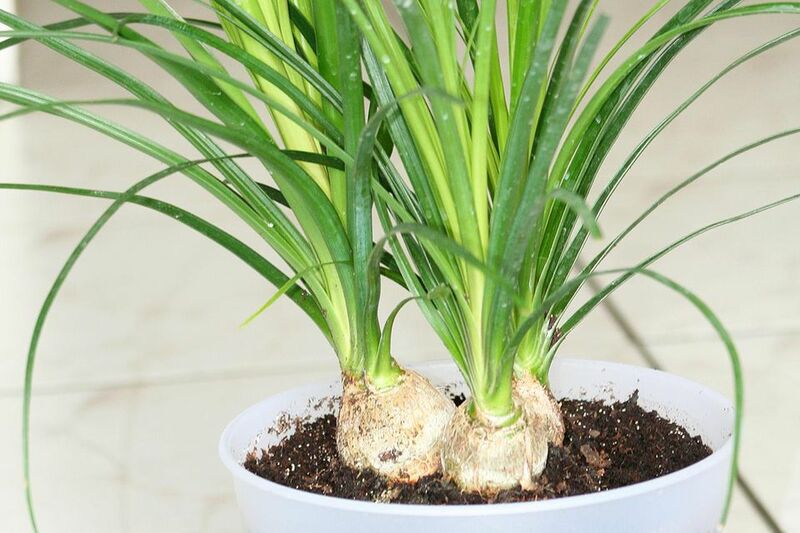 Indoors, these novel little palms are often grown in shallow pots, with a tuft of strappy green leaves emerging from a bulbous stem that seems to erupt from the soil. Given time and the right conditions, however, these plants will grow into respectable specimen plants, up to 6 feet in height or more. They are native to arid regions in Mexico and are among the easiest palms to grow indoors. Light: Bright light. Ponytail palms can be acclimated to full sun. Water: During the growing season, water every 7 to 14 days. The bulbous stems store water, so be careful not to overwater. During the winter season, cut back water to monthly. Temperature: They prefer warm, arid temperatures, above 60 F. However, they will survive down to 50 F, providing they are not exposed to prolonged cold. Soil: Rich, organic, fast-draining potting soil. Fertilizer: Feed weekly with liquid fertilizer during the growing season, or use a slow-release pellet fertilizer in the spring. Reduce feeding during the winter. Ponytail palms sometimes have offsets from the base that can be potted up individually. Generally, however, this is a difficult task to master because of a lack of roots on the offsets. (Besides, a multi-stemmed ponytail palm is a highly prized indoor plant.) If you want to try, use a rooting hormone to stimulate new root growth. They will rarely, if ever, flower indoors to produce viable seeds. Repot in the spring as needed. If your goal is to grow a large palm tree, repot every year. If you want to keep it smaller, repot every other year. Like most palms, ponytail palms will thrive when slightly underpotted. The ponytail is basically a "plant it and forget it" kind of plant, providing it has enough light to thrive and somewhat steady water throughout the growing season. Because this is an arid plant by nature, periods of dryness are not deadly for an established plant. As with all palms, ponytail palms should never be top-trimmed, and they will respond wonderfully to a consistent feeding program in the growing season. Keep in mind, though, that the ponytail palm is an extremely slow-growing plant, so don't expect your desktop plant to transform into a corner specimen in one or two growing seasons.